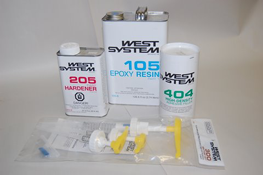 WEST SYSTEM epoxy products make up a versatile epoxy system that can be used for everything from basic long-lasting repairs to the construction of high-performance composite structures. Select the products that allow you to tailor the epoxy to your working conditions and application. WEST SYSTEM epoxy cures to a high-strength plastic solid at room temperatures, by mixing specific proportions of liquid epoxy resin and hardener. This highly moisture-resistant plastic adheres to a wide range of materials, making it ideal for projects that require water and chemical resistance, and strong physical properties for structural bonding. Select from a range of hardeners and additives that allow you to tailor the mixture’s handling characteristics and the physical properties of the cured epoxy to suit your working conditions and specific coating or bonding application. 1. Start with 105 Resin, the basic ingredient of all WEST SYSTEM epoxy compounds. Use 300 Mini Pumps for convenient and accurate metering. 3. Add one of six WEST SYSTEM fillers to thicken the mixture as needed. Select a filler for its handling characteristics or cured physical properties. Or, add one of four WEST SYSTEM additives to provide specific coating properties. WEST SYSTEM epoxy is designed specifically to wet out and bond with wood fiber, fiberglass, reinforcing fabrics and a variety of metals. An excellent adhesive, 105 will bridge gaps and fill voids when modified with WEST SYSTEM fillers and can be sanded and shaped when cured. With roller applications, it has excellent thin-film characteristics to flow out and self-level without “fisheyeing.” The resin cures clear so you can achieve a natural finish when coating with varnish. It is formulated without volatile solvents and does not shrink after curing. It has a relatively high flash point and no strong solvent odor, making it safer to work with than polyester or vinylester resins. Resin viscosity is approximately 1000 centipoise (cP) at 72 degrees F (22 C).